This is the fifth in a series on construction defects found in the Greater Toronto Area, Ontario, Canada. 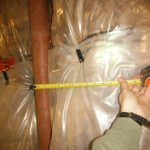 The photos show a steel column installed against the exterior wall of a basement in Richmond Hill. This is new construction in Richmond Hill, completed in 2016. I inspected the house in early 2018, on a mission to help the homeowner with a suspected leaky roof. For the average homeowner nothing seems out of order. For an inspector who knows even the basics of structure in residential construction, this red column is a red flag. When a beam reaches the outer foundation wall, it is customary to support that beam on the concrete foundation wall, either in a beam pocket set in to the foundation wall, or on a pilaster (concrete pier integrated with the foundation wall). Columns bearing at basement floor level, and supporting first storey floor structure are not usually found against outside walls. The purpose of the column is to support the steel beam that in turn supports the floor joists and other structure for the floors above. Columns are installed on footings, which are pads of concrete that are installed on undisturbed soil. The footing pad serves to distribute the load (weight) over a large enough area that the soil can support it without moving. The size of the footing for a column can vary depending on the load and soil conditions, but let’s say a typical residential column footing in the GTA might be 34” by 34” and 16 inches deep. 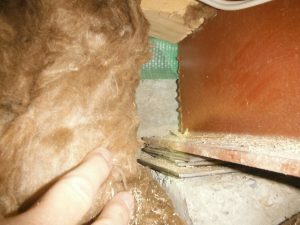 The problem is that this particular column is not bearing on a pad footing, it is bearing at the outer edge of a strip footing. A typical strip footing for a foundation wall may be 19” wide, so with an 8-inch foundation wall in the centre, that footing will protrude 5.5 inches in to the basement space. The pilaster close to the column was obviously the intended location for the beam. The photo shows that the column is about 12 inches away from the centre of the pilaster. The homeowner obtained the construction drawings from the City, and confirmed that the plan called for the beam to rest on the pilaster, and that no changes had been approved by the City. This is a dimensional error that should have been caught and corrected earlier. The fresher concrete around the base indicates the column was installed after the basement floor slab was installed. Probably wood was used to support that end of the beam until the additional steel column arrived on the job. The photo at left shows a typical beam installation, with the beam bearing on a concrete pilaster at the foundation wall. Steel shims are used for leveling. This was the intended design for the beam in question. All of those involved in the framing of this house would have known that the misplaced column is not acceptable, and of course the column is out in the open to be seen by any inspectors or supervisors from the builder or municipality. The errant column and the other related dimensional errors made it through the builder PDI with flying colours. 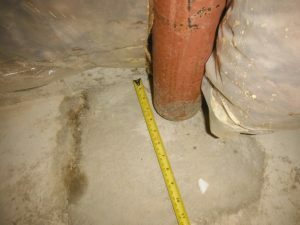 When the home owner reported the issue to the builder after my inspection, the initial response was along the lines of “don’t worry, we’ve been doing this for over 20 years…” The homeowner was then forced to invoke support from Tarion and from the City building department to get further assessment and remediation.